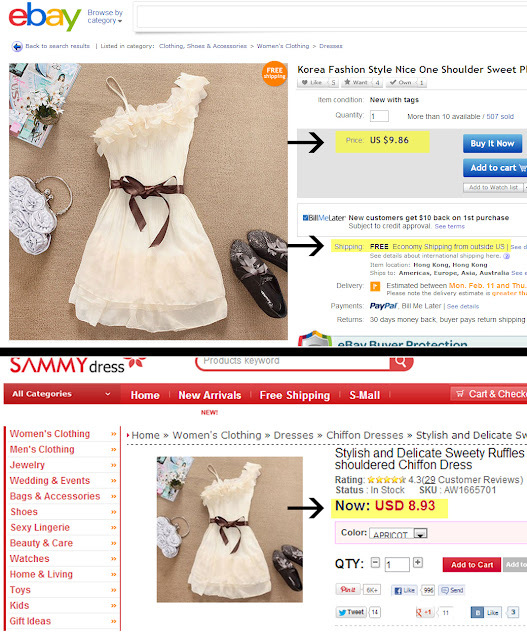 A friend of mine Beth from Stories of A to Z recently emailed me about Sammydress.com. There are similar sites like Causeway Mall, Fashion4us. If you don't mind buying them these sites, you can get really good deals on clothing (like dresses for $7) BUT the shipping costs ($60+) kinda make it only useful if you are buying a large quantity of clothing. However, I do have a small tip for you! It doesn't always work but if you're looking to only buy one thing, you can sometimes avoid the shipping charges. Many Hong Kong, Chinese and Korean eBay sellers sell the same items. Just find the item you want on their site and then do a 'Drag and Drop' Google image search and see if an eBay listing appears for that item. At times, it's just $1 more than on the Sammy site and offers FREE or low cost shipping. 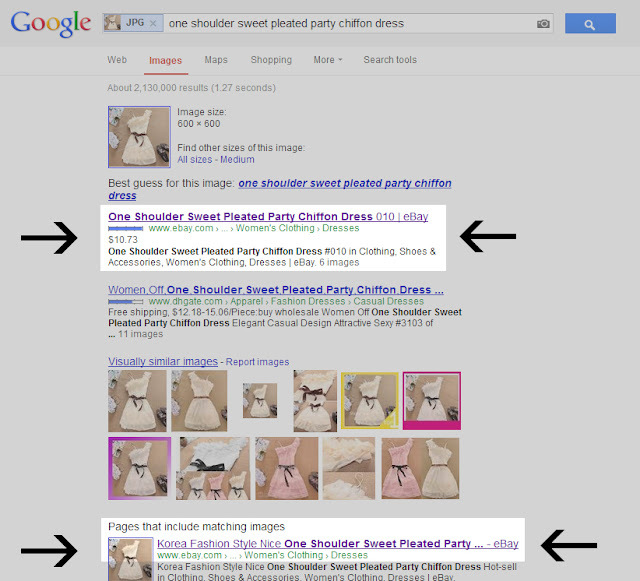 Sometimes if the Google image search doesn't produce anything I add "ebay.com" in the search box. I don't know why eBay hasn't come up with their own image search option yet. But if they did it would make the whole process even easier. Maybe that's why they're doing it? Making it too easy for buyers to get the cheapest price? 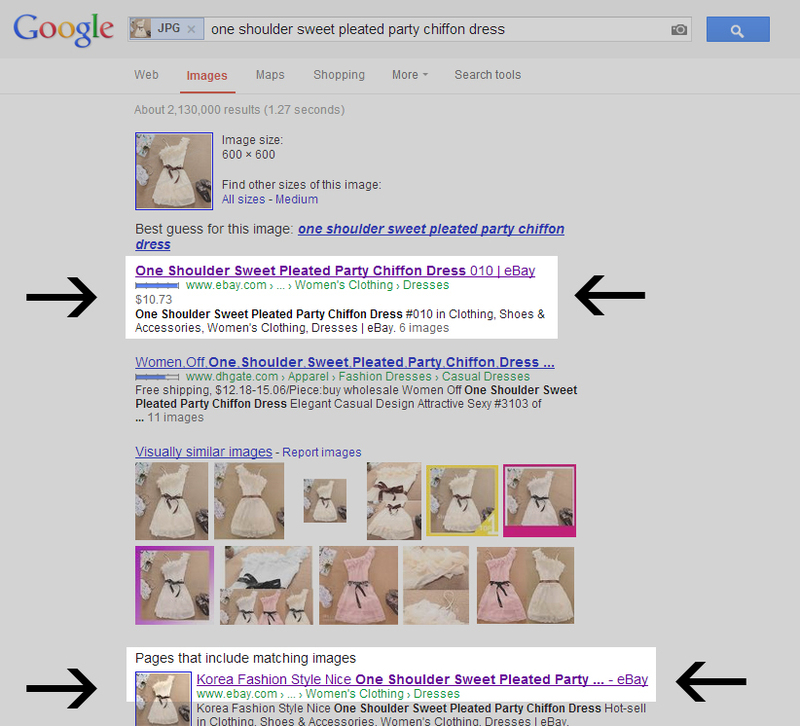 I don't think it's even possible to do a 'Drag and Drop' image search in Google while adding a filter to look in one specific site. You CAN do that but not with the 'Drag and Drop' feature. Weird. this is brilliant! Thanks for the insight! Great idea! Have you shopped at that Sammy store before? I've been curious about it because I've seen some bad reviews on how the clothes come in bad condition, or never arrive. So, I'm curious is anyone has shopped their store before. Just a heads up. Many of the clothes are made to fit asian women and they might be smaller than american clothes. thx for the tip!!! I love their stuff but I dont get the sizing? so Ive been too scared to try??? I would caution to really be careful when buying clothing from Asia based Ebay sellers. The garments they are selling are often cheap knock-offs that do not match the images they put up. I know this because a relative of mine used to own a garment e-commerce business based out of China and saw their products being "sold" on ebay all the time. The studio photos and close ups come from legitimate manufacturers which produce decent the original items, but the ebay products are unwearable, shoddy mimics. China has extremely weak copyright laws, and these promotional materials are frequently stolen for ebay without consequence. These sellers will also mislead buyers by making dummy accounts and faking their feedback. Be vigilante!! !